Brittany S. Pierce has been tormented by Britney Spears her whole life. But she overcame that by making like the singer. Brittany makes like Britney Spears in this still image. Aptly, it's courtesy of the episode "Brittant/Britney." How awesome does Brittany look at Britney?!? This, of course, is a shot from the Glee Britney Spears episode. This is cute. Finn and Rachel are a full-fledged couple on season two of Glee. It's nice to see. Rachel is standing in the boys' locker room in this scene. She's visiting her man, Finn. There's a new football coach in town. And she means business, as Beiste is seen here on the second episode of season two. Artie and Finn share a moment in this scene from Glee. It's courtesy of the second episode of season two. It's John Stamos on Glee! He plays a dentist who is smitten with Emma on season two. What perfect guest casting. 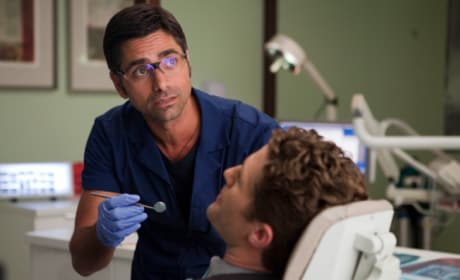 John Stamos will come on board Glee in season two as a dentist who dates Emma.